Dr. Gulani is currently a fourth-year Resident in Radiology at the University of Michigan, Ann Arbor, MI. He completed his PhD under Paul Lauterbur, PhD, at the University of Illinois, Urbana-Champaign, and received his MD from the same institution in 2000. He recently completed a year of Postdoctoral Fellowship (2003-2004) at the Institute for Physics at the University of Würzburg, Germany. Following residency, he will stay at the University of Michigan for a Fellowship in Body MRI. Higher field strengths have become attractive in nearly all aspects of magnetic resonance due to the potential for increased signal-to-noise ratios (SNR) and diminished acquisition times. Even leaving aside the world of high-resolution, high-field protein spectroscopy and focusing only on imaging, it becomes clear that the definition of "high field" is different for different people. In animal imaging and localized spectroscopy, for example, at least 2 institutions have at their disposal the services of 17.6T (750 MHz proton resonance) vertical bore spectrometers equipped with imaging gradients. In the realm of human imaging for research, 4T (170 MHz) systems have long been employed, 7T (298 MHz) and 8T (341 MHz) systems are functional, and a 9.4T (400 MHz) system is operational and can soon be used for human imaging (Personal comminication, Dr. X. Joe Zhou, University of Illinois, Chicago, IL, July 2004). The definition of high field in the clinic has also been shifting. In the early 1980s, 0.3T was considered the upper limit of practical imaging. 1 At this time, design considerations for radiofrequency (RF) coils and difficulties with RF penetration seemed to limit the application of high-field imaging. 1-4 Even as a high-field clinical standard of 1.5T (64 MHz) was being established, questions were raised regarding what may be an ideal field strength for imaging, given issues of power deposition, relaxation times, chemical shift artifacts, and imaging times required at higher fields. 5 It is interesting to note that many of these same concerns again dominate the discussion nearly 20 years later as we move from a 1.5T (now standard) to 3T (128 MHz) as the new clinical high field. As this review aims to offer the clinical scientist a summary of high-field imaging and spectroscopy, this last definition of high-field imaging will be used here. Put simply, the lure of higher field strengths is in the gain in SNR that is possible with higher resonance frequencies. It is worthwhile to take a closer look at how this gain in SNR comes about. The SNR in magnetic resonance imaging (MRI) can be broken down into 2 components- the detected signal and the noise. Evaluation of each of these 2 components of the SNR reveals the theoretical advantage of higher field MRI. Here k and T are again the Boltzmann constant and temperature, respectively, R coil is the coil resistance, R patient is the effective patient resistance, and ∆ f is the signal bandwidth. At higher fields (including 1.5T), when large coils are used, the noise is dominated by the patient resistance, which is proportional to the square of the field strength. It becomes evident that the noise is linearly proportional to B 0 , 6 notwithstanding adjustments to the bandwidth. Combining the relationships of signal strength and noise to the field strength, the SNR in MRI can be expected to increase approximately linearly with field strength (for B 0 > 0.04T). 7 The direct relationship between signal strength and B 0 has been shown to hold true between 0.12T and 1.5T 8 and between 4T and 7T. 9 However, this analysis assumes that a constant bandwidth is used for imaging. Depending on the imaging needs at hand, the receiver bandwidth may also need to be increased (as, for example, with echoplanar imaging [EPI], or when chemical shift artifacts are of concern), further increasing the noise in the system and decreasing the achievable SNR gain. If SNR were the only factor to be considered, then this discussion would imply that there is always a benefit from going to ever-higher field strengths. However, high-field imaging also poses some challenges that complicate such a straightforward analysis. Relaxation effects, for instance, pose a distinct disadvantage at higher fields. Various authors have examined the effects of field strength on relaxation properties from 0.0002T up to 7T. 10-19 A tabulation of T1, T2, and T2* relaxation times for field strengths ranging from 1.5T to 7T 20 and theoretical discussions about the dependence of relaxation times on resonance frequency 6,21 can be found elsewhere. To summarize, however, T1 lengthens with increasing field strength, while T2 and T2* both shorten. From this, it is evident that adverse SAR effects are exponentially worsened at high fields. It is also clear that sequences, such as fast spin echo (FSE), that employ a large number of closely spaced RF pulses with large fiip angles, are most likely to cause increased power deposition at higher fields, and thus face most limitations due to regulations on allowable SAR levels. Unfortunately, because they rely on T2-weighted rather than T2*-weighted echo trains, FSE sequences are also those least sensitive to susceptibility induced image distortions, and, therefore, potentially extremely useful at higher magnetic fields. 20 Furthermore, if the SAR problems of the affected sequences are partially alleviated by employing longer repetition times (TR), then not only does the imaging time lengthen, but also the T1 weighting of the sequence decreases, which is not necessarily desirable. SAR effects, therefore, further complicate the choice of sequences and parameters for high-field imaging and, potentially, partially offset the benefits of the field strength. While the promise of higher SNR provides the attraction to high-field imaging, preserving this hard-won SNR is a more complex task. The penalty for T1 lengthening, for example, is paid with either an increase in imaging time due to longer TRs for equivalent T1-weighting, loss in some of the potential gain in SNR by maintaining an equivalent TR, or by using some of the increased SNR to lengthen the echo train in multiple echo rapid sequences. Multiple strategies are available to counter the worsened SAR effects in FSE sequences. The most obvious solutions are to decrease the duty cycle by increasing the echo spacing and decreasing the echo-train length, or to employ smaller 32 and nonconstant fiip angles, α. 33-35 However, both these methods involve tradeoffs-the former entails increased imaging time, and the latter, an SNR penalty with concomitant lengthening of imaging time or loss of contrast. The result is suboptimal scan efficiency; the CNR gained per unit time is not maximal. This leads to the formation of a hyperecho or "echo of echoes," which contains, for tissues with T1>>T2, greater signal intensity than the echo would otherwise have from conventional Carr-Purcell-Meiboom-Gill (CPMG) experiments, due to contributions from stimulated echo pathways. By using the hyperecho as the center k-space line for the image, the net result is greater SNR than that seen in comparable conventional FSE sequences, with marked reduction of SAR. This advantage of the technique is presented in Figure 1, which shows that compared with the fully refocused sequence (Figure 1A), use of the hyperecho technique (Figure 1C) results in SAR reduction of 76%, while tissue SNR is increased. 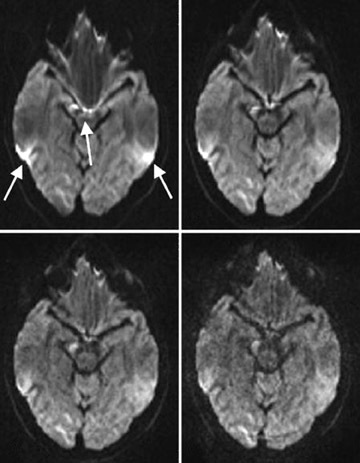 The re-duced αacquisition (Figure 1B), in contrast, results in noticeable loss of SNR. Functional MRI was perhaps the application earliest affected by questions regarding moving to fields higher than 1.5T. Most commonly, brain function is imaged by using BOLD contrast. 47 Deoxyhemoglobin is paramagnetic, while oxyhemoglobin is diamagnetic. When a region of the brain is activated, the blood fiow to that region increases out of proportion to the change in oxygenation extraction of the tissue, resulting in signal changes dependent on fiow, volume, and oxygenation status. These changes can be used to indirectly detect neuronal function. 48 This experiment is affected at multiple levels by the field strength. The BOLD fMRI signal change is dependent approximately linearly upon field strength. 49,50 Moreover, as the field strength increases, the BOLD fMRI signal contains increasing contributions from tissue as venous signal diminishes due to T2* shortening. At low field strengths, a greater proportion (if not the majority) of the fMRI signal comes from larger vessels that are not as well localized for imaging function. 51-54 Higher resolution studies, constrained at lower fields due to SNR, are also possible, allowing better localization of function. However, the physiological noise, particularly that due to respiration, is accentuated at high fields due to worsening of the susceptibility effect, although multiple options exist to minimize or remove such problems. Thus, overall the BOLD experiment is greatly aided by higher field strengths, and fMRI has been one of the driving forces behind moving to high fields for human imaging, and is pushing the development of 7T to 9.4T magnets for use in human imaging. 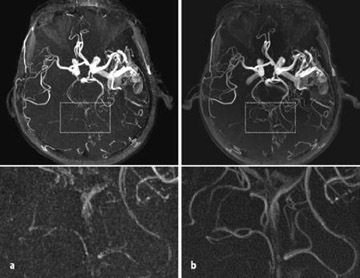 A fast growing application of MRI in recent years has been MR angiography (MRA), which benefits greatly from moving to higher fields. The most obvious reason is the increased inherent signal available at higher fields. More importantly, however, the inherent lengthening of T1 at higher fields means that the "tag" in time-of-fiight (TOF) angiography persists for a longer time, improving the available SNR and also aiding in background suppression. The result is better small vessel delineation and fewer artifacts in display of larger vessels. 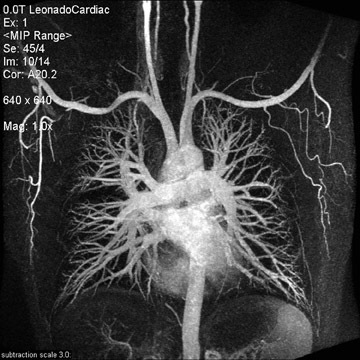 58,59 Magnetization transfer contrast (MTC) is often used to aid in back- ground suppression in angiography at 1.5T. While SAR considerations do raise questions about the feasibility of MTC at very high fields in humans, at least at 3T it has been shown to be applicable. 60 The advantage of higher field strength for MRA applications is clearly seen in Figure 3, 46 which presents cerebral MRAs obtained at 1.5T (Figure 3A) and 3T (Figure 3B). Vessel detail and background suppression are superior in the 3T image. 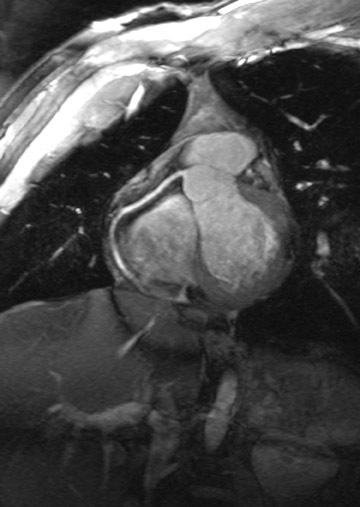 The future possibilities of high-field MRA can also be seen from Figure 4, which depicts an image from a pulmonary angiogram obtained at 3T. 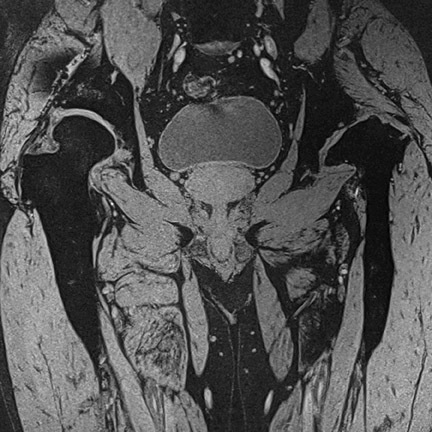 Again, the vessel detail obtainable is exquisite, and the image shows how the gains described earlier could help expand the role of MRA in diagnostic imaging. 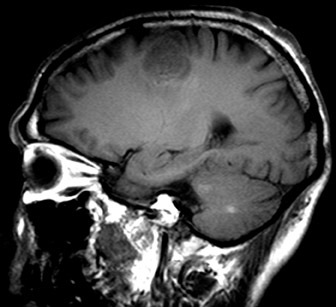 Single-voxel localized spectroscopy and spectroscopic imaging are increasingly important tools in the radiologist's hands, finding application in a wide variety of diseases, including, but not limited to, epilepsy, stroke, multiple sclerosis, human immunodeficiency virus, and dementias. Due to inherent SNR limitations and, therefore, signal averaging/imaging time requirements, these are also areas that have much to gain at high fields. The SNR considerations resulting in doubling of SNR with a concomitant increase in field strength have largely been discussed earlier and hold true for MR spectroscopy (MRS). In addition, the doubling of field strength from 1.5T to 3T results in doubling of the chemical shift between metabolites. Theoretically, therefore, MRS at 3T should show double the SNR, improved baseline definition, and improved spectral resolution, allowing the detection of less concentrated metabolites. In practice, however, the improvement in SNR in at least 1 direct comparison of 3T versus 1.5T was considerably less than the predicted doubling of the SNR. 61 This is thought to be largely due to line broadening from T2 relaxation and field inhomogeneities. Nevertheless, MRS does improve substantially at higher field strengths and has found clinical application at 3T, especially with the availability of automated algorithms that ease implementation. 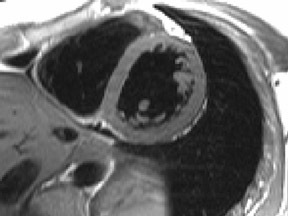 62 The higher achievable SNR also means that it may be possible in the future to perform MRS more easily with nuclei such as 23 Na, 31 P, 19 F, or 13 C.
Imaging the heart presents a special challenge in MRI in general. 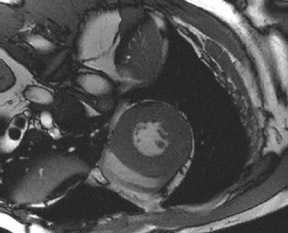 Since the heart is a moving target, cardiac imaging requires high temporal resolution for imaging, while preserving high spatial resolution for applications such as coronary artery imaging. 63 In this regard, high fields seem to be ideal for this area of MRI, as they provide the promise of increased SNR that can be used to increase imaging speed or resolution. However, in practice, the SNR gain has been less than the theoretically predicted linear increase with field strength. 64,65 This may be partially due to the fact that cardiac high-field imaging is made difficult by shortened T2* times (susceptibility problems are already heightened in the chest cavity), field focusing/dielectric resonance effects, and the need for rapid imaging pulse sequences that require shortly separated RF pulses that pose SAR problems. Nevertheless, high fields have opened new doors in cardiac imaging, improving the contrast and resolution available for short- and long-axis cine imaging, 65,66 myocardial tagging, 67 and coronary artery imaging. 68,69 Parallel imaging is especially applicable in cardiac imaging, where speed is at a premium. 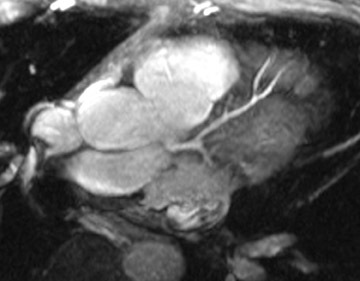 Some of the possibilities of cardiac imaging at high fields are illustrated by the anatomical detail seen in the papillary muscles and the coronary arteries in Figures 5 and 6. The promise of increased SNR means that nearly all aspects of clinical MRI can theoretically be improved by moving to higher field strength. As has been the case with many advances in MRI, neurological MRI has particularly benefited from the move to higher fields. In addition to the advances in angiography, fMRI, MRS, and MR spectroscopic imaging (MRSI), all of which directly affect neurological imaging, routine structural imaging of the brain and spine shows improved resolution due to SNR gains. 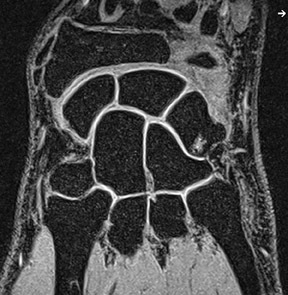 Therefore, lesions are more conspicuous both in contrast enhanced and nonenhanced scans. 62,70-72 These observations have included, but are not limited to, tumors, demyelinating lesions, hemangiomas, and ischemic lesions. Diffusion tensor imaging (DTI) is also constrained by SNR/resolution tradeoffs. 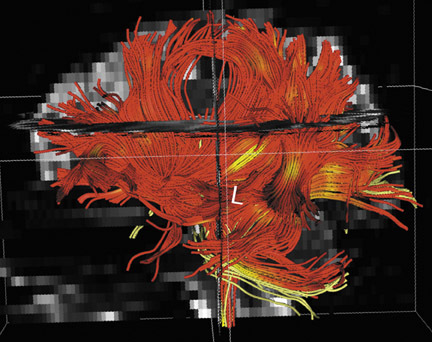 Thus, the results at high fields can be remarkable, as illustrated by the fiber tracking experiment on a patient with a glioma in Figure 7. Generally, in MRI there is a complex tradeoff between SNR, imaging time, and resolution. A fundamental hardware im-provement, such as moving to a higher field (a shifting target which presently means 3T for the clinician), allows one to bypass this tradeoff and gain SNR without concomitant penalties in temporal or spatial resolution, potentially allowing clinical examinations and studies previously impossible. This promise of SNR is the lure for the scientist and clinician alike toward high-field magnets, despite their monetary costs and siting requirements. A straightforward analysis shows that SNR can be expected to increase at most approximately linearly with field strength. However, high-field imaging poses some unique challenges, including relaxation properties, power deposition, and RF in-homogeneities. Thus, the practically realizable SNR gain is often considerably less than the maximal predictions. Nevertheless, by adjusting the imaging sequences and parameters, and by employing strategies specifically targeted at high-field imaging, the problems can be at least partially overcome. This allows the preservation of some of the hard-won SNR to greatly improve MR image quality in a wide variety of applications, particularly those that are SNR-starved at 1.5T. The author would like to thank Mr. Robin Heidemann of the University of Würzburg for his invaluable help in obtaining figures and for discussions pertaining to parallel imaging at high fields. Dr. Ioannis Panagiotelis of Siemens Medical Solutions graciously provided images for several of the figures depicted here. Many thanks also to Mr. Peter Schmitt, Dr. Mark Griswold, Dr. Xavier Helluy, Dr. Peter Jakob (all at the University of Würzburg), Dr. Andrew G. Webb (University of Illinois at Urbana-Champaign and University of Würzburg), Mr. Alberto Vazquez, and Dr. Hero Hussain (University of Michigan) for stimulating discussions and help with proofreading or preparation of the manuscript. Funding for the author's past year of work was provided through the Wolfgang Paul Preis by the Alexander von Humboldt Stiftung. High-field human imaging. Appl Radiol.